Last December, the United Nations General Assembly proclaimed 2021 to 2030 as the Decade of Ocean Science for Sustainable Development. The ambition of the Decade of Ocean Science is to mobilize the scientific community, policy-makers, business, and civil society around a program of joint research, innovation, and engagement. Ocean science holds a key to a sustainable future—a more integrated and sustainable ocean observing system, a solution-oriented integrated ocean science agenda, global capacity-building, and effective governance of the ocean will be crucial for a sustainable future for us and for generations to come. The ocean plays a crucial role in supporting life on Earth. A positive development for humanity will particularly depend on our interaction with the ocean. Covering two-thirds of the Earth’s surface, the ocean is home to the largest and most diverse ecosystem holding vast and, in some cases, untouched resources. The ocean produces more than half of the atmospheric oxygen, which is more than all rainforest combined. It provides us with our basic needs such as food, materials, energy, and transportation. We also enjoy the seascape for religious or recreational practices. The ocean also contributes to global and regional cycles and dynamics. As the largest heat and CO2 sink, the ocean plays a key role in anthropogenic-influenced climate change. The ocean is therefore significant for the world’s climate, biodiversity, economy, and human development. According to World Bank figures, about 300 million jobs are linked to the ocean globally and more than 90 percent of world trade is handled by maritime transport. One billion people in developing countries rely on fish for their primary source of protein and more than 45 million people earn their living in fishery and another 150 million in the fish processing industry. For millennia, the abundance of food has lured people to the shores, and 15 out of 20 megacities are coastal with already more than 2.8 billion people living in areas within 200 kilometres of the ocean – almost 40 percent of humanity. 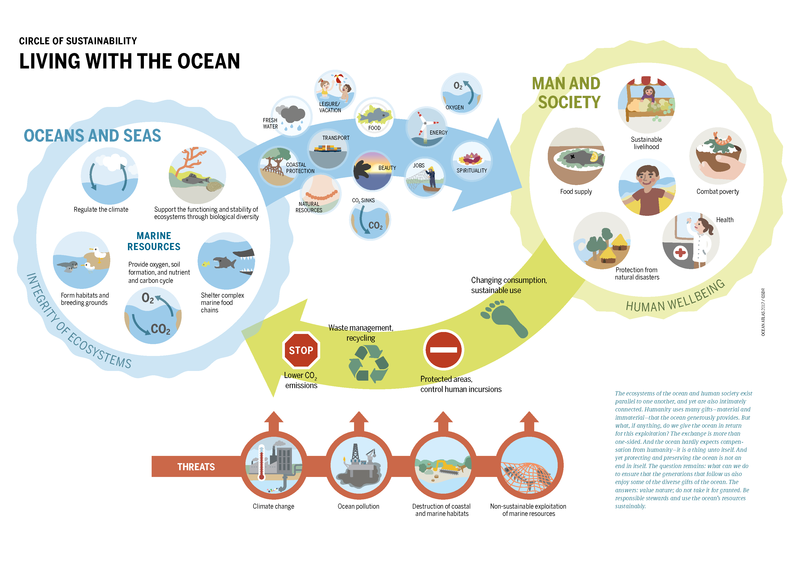 Doubling of the world population over the last 50 years, rapid industrial development, and growing human affluence are exerting increasing pressure on the ocean ranging from overfishing, non-sustainable resource extraction, climate change, various types of mainly land-based pollution, to habitat degradation are threatening the productivity and health of the ocean. As humanity depends on a productive and ‘healthy’ ocean for food security, transport, energy, and material but also tourism and cultural services, how do we achieve a sustainable balance between the use and protection of the ocean? While there are large and significant challenges, there is also hope. Politicians, ocean-related industries, and civil society have been increasingly aware of this dilemma. However, we are still not at the point where we are addressing ocean issues with sustainable solutions based on solid scientific understanding. Scientific understanding of the ocean’s responses to pressures and management actions can significantly contribute to the knowledgebase for sustainable development. Ocean observations and research are also essential to predict the consequences of change, to inform the design of mitigation options, and to guide adaptation strategies. Some of the needed transformative solutions require consensus and global cooperation in order to successfully implement actions. The UN Decade of Ocean Science will encourage actions towards a more integrated and sustainable ocean observing system to facilitate ocean discovery and environmental monitoring. The Decade of Ocean Science should address both deep disciplinary understanding of ocean processes and solution-oriented research to generate new knowledge. This will support societal actors in reducing ocean pressures, preserving and restoring ocean ecosystems, and safeguarding ocean-related prosperity for generations to come. A solution-oriented and integrated ocean science agenda can provide innovative ideas, improved assessments, and fundamental knowledge in the context of sustainable development to improve human-ocean interactions. Adaptation strategies and science-informed policy responses to global change are urgently needed. Our future is determined by our present decisions and actions. These actions will have a major impact on whether we move towards a sustainable future or enter an uncharted territory of dangerous human interference with nature. The success of the Decade of Ocean Science will critically depend on global capacity-building and resource-sharing between countries at different levels of wealth and development. The increasing engagement of the scientific community with societal actors in searching for sustainable solutions of the ocean and climate challenge can help avoid the worst scenario and give rise to ocean optimism. As mandated by the UN General Assembly, the Intergovernmental Oceanographic Commission (IOC) of UNESCO will coordinate the Decade’s preparatory process—inviting the global ocean community to plan for the next ten years in ocean science and technology to deliver together the ocean we need for the future we want, to reduce ocean pressure, to preserve and restore ocean ecosystems, and to safeguard ocean-related prosperity for us and for generations to come. Read Martin Visbeck’s article on ‘Ocean science research is key for a sustainable future’ in the Nature Communications Journal. To learn more about climate change and sustainable development, register in our online course ‘The Paris Agreement on Climate Change as a Development Agenda’.